Every asset, liability and owners' equity account has what we call a "T-Account" that is recorded in the ledger. T-accounts get their name from the shape that they make. T-accounts have two sides: the left hand side for debits and the right hand side for credits. For example, we would have a T-account that looked like this for the cash account. The T-accounts follow the rules of debit and credit. These rules follow the equation Assets = Liabilties + Owners' Equity. We assign normal debit balances to asset accounts - that is, accounts on the left hand side of the equation. We assign normal credit balances to liability and owners' equity accounts - that is, accounts on the right hand side of the equation. We use the rules of debit and credit to determine how a transaction should affect the balances of our T-accounts. We use these rules to first to record the transactions as journal entries in the general journal. 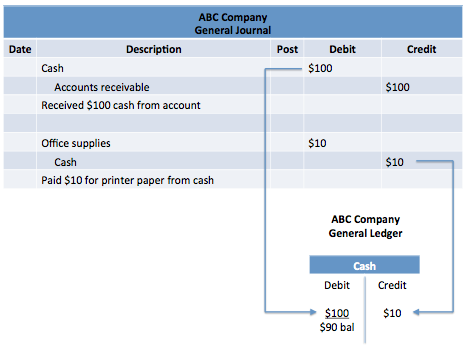 Next, we take the recorded transactions from the journal and post them, or copy them to the ledger accounts. For example, Cash is an asset account, so it would have a normal debit balance. Imagine we have a journal entry that shows we received $100 in cash for an accounts receivable. We would copy this transaction with a debit to cash of $100. Imagine a second entry where we paid $10 cash from our Cash account for an office supply. In this case, we would post the entry with a credit of $10 to the Cash account to reduce the amount of the cash balance. A quick summary of how debits and credits either increase (+) or decrease (-) each type of account is provided below. Revenues, expenses and dividends are accounts that are closed out to retained earnings at the end of the period. Because expenses and dividends will decrease the amount available for retained earnings, we call these contra accounts. That is, these accounts exist on the right hand side of the accounting equation, but have a debit normal balance not a credit one. In this way they offset retained earnings, which has a credit balance. 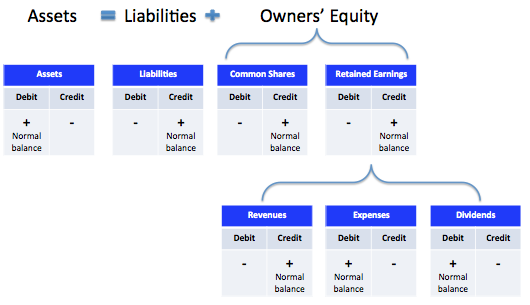 We can therefore expand the accounting equation: Assets = Liabilities + Owners' Equity + (Revenue - Expenses) - Dividends. Why would use a T-account? Why do we use them as a students? Please instruct me on how a cover letter for managing cash flow should be written. Write about "How to manage cash Flow"
In at least 200 words, describe how accounts receivable arise and how they are accounted for, including the use of a subsidiary ledger and an allowance account. Can you help me get started with this assignment? Please see ** ATTACHED ** file(s) for complete details!! The ledger accounts given below, with an identification number for each, are used by Tyler Company. Please help with the following problem. What is the purpose of subsidiary ledgers? What are the possible ramifications of not using subsidiary ledgers? Set up the following in T-account form and determine the ending balance insofar as these accounts are concerned. BEGINNING BAL. ACCOUNT Dr. Cr. Find the beg. balance of Work in Process - Refining Department. The book says the balance was in the given information. I put the given info. in gray.